You'll be £6.00 closer to your next £10.00 credit when you purchase The Family History Web Directory. What's this? 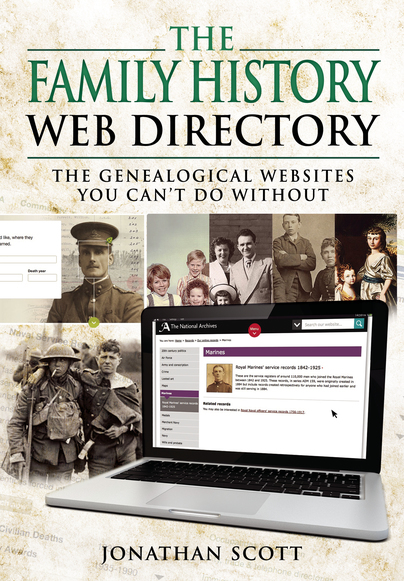 Jonathan Scott's Family History Web Directory is an information-packed reference guide that distils the best of the internet into one easy-to-use format. Themed sections cover different topics, from 'getting started' to specific occupations, and there is an index reproducing all the websites in A-Z order. His handbook is a vital source for less experienced researchers, and a handy aide-memoire for more seasoned campaigners. Web addresses are listed by topic, then in order of importance and usefulness. An extraordinary range of sites that will interest family historians is included – from records of births and deaths, tax, crime and religion, to military records and records of work and occupations. Also featured are sites that give information about archives, blogs and forums, social networking and sharing research. The internet can be an overwhelming place for the genealogist. Jonathan Scott's book provides readers with online shortcuts, tips for getting the best from well-known websites, plus the details of all kinds of lesser-known and hard-to-find sources. This valuable book covers so many subjects and if you use a computer for research, you need this by your side! A useful reference guide, for beginners and experienced family historians alike. Those starting down the trail of researching a particular occupation or event, or seeking information on a particular religion, are likely to find something here that will tempt them. Jonathan Scott has had more than a decade writing about genealogy online and his knowledge, enthusiasm and good humour shines through this very useful book. A practical book for beginners and the more experienced. I liked the logical introduction to the aims of the book. The clear, concise instructions to accessing the websites would enable a novice user of technology to get to grips with searching on the internet quickly. Each website is given a clear standardised entry i.e. name, internet link and a description of what the website does and the information included. It would be a tall order to be a completely comprehensive guide to internet sources, but this book has a good stab at it. The section headings are clear: First Steps, Digging Deeper, Military and Conflict, Occupations and Miscellaneous with subject related sub sections within each with many ‘see also’ cross references. In the miscellaneous section there are useful sub sections on sharing your research, social media and software and apps. The index is excellent. This author has done the hard work for you by visiting the websites and finding specialist sites that may be hard to locate using a search engine. He also gives sage advice to researchers: websites are changing all the time so there may be sites listed that are no longer live and to ‘make notes, either digital or physical. If you don’t leave a trail of breadcrumbs sooner or later you will end up going round in circles’. ...Overall, this is a good book and should sell by the bucket-load at fairs such as Who Do You Think You Are?